After flying an Enya 46-4C with spark ignition, I had to try an OS with spark. I decided to try converting the FS-52 as it was in the same size range and would fit the model I was flying the 46-4C on. After checking over one of my FS-52 four strokes, I decided to make the conversion. A few updates were added while I had the engine apart. The bearings were replaced. Instead of the sealed main bearing and shielded front bearing, I decided to use an open main and sealed front. This is to go along with the crankcase vent modification. The crankcase was cleaned up on the front bearing housing. I had an RCEXL spark ignition on hand and installed it on two rings. One ring was machined for the pickup mount. A set screw locks this ring in place and allows timing adjustment. The magnet was mounted into a ring that was pressed over the original prop driver. Look mom, no more crankcase breather! 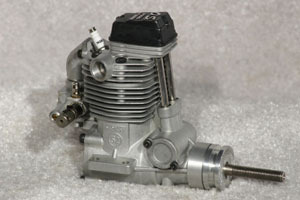 The recently released OS Alpha series four stroke engines have no crankcase vents. There is a passage to allow oil by the cam followers into the rocker well in the head. 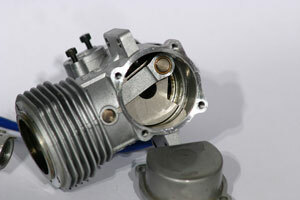 A hole connects crankcase to the intake port to make a positive crankcase ventilation system. The bearings were chosen to complement this system. The front sealed bearing keeps oil from leaking out, and dirt from being drawn in the nose. 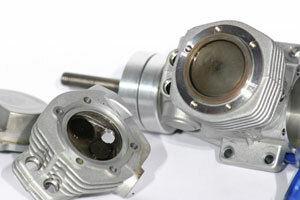 The open main bearing allows oil to move freely to the cam gear box. A gasket was made for the rocker cover and the backplate was sealed with sealant. 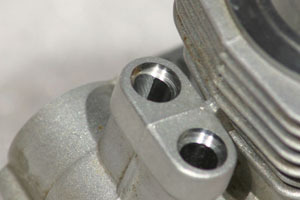 The crankcase vent is plugged with a set screw. I'm using an NGK ME-8 spark plug which fits the 1/4"-32 glow plug thread. The original spark plug boot on the ignition was for 14mm plugs so I made a new one from a McDaniel Head Lock glow plug driver. Ingintions with the appropriate boot for 1/4"-32 plugs are readily available." Here is a photo installed in my trusty Avistar test bed. 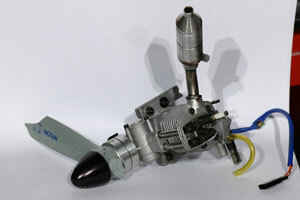 The ignition is squeezed inside the nose along with a 6 oz fuel tank. I plumbed the tank with Tygon so I could can use any fuel. 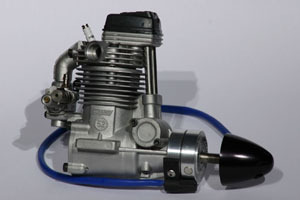 The engine turns the Graupner Super Nylon 12x6 at 10,000 RPM and idles at about 2200. It will idle at lower speeds but transition is not reliable. The carb is more sensitive than I was expecting with methanol fuel. I think I can get a little more power out of it by optimizing the timing. Starting is extremely easy as the video below shows. 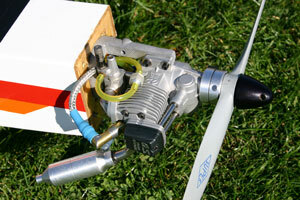 During the summer of 2009 I flew this engine on E85 fuel with 8% Klotz Original Techniplate oil. Power is slightly lower than on methnanol with about 9800 RPM on the same prop. Starting is more difficult with E85, but an electric starter makes it easy. My first spark plug boot failed after 2-3 hours and subsequent boots literally in minutes. I replaced the ignition with another that was supplied with a boot to fit the 1/4"-32 spark plug. It has been reliable ever since. Click the image to the left to start the video player. This was a cold start on a 65°F day. It likes to start fairly wet. The guys at the field were just snickering. 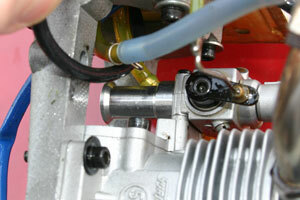 Late in the Fall of 2009 I added a "velocity stack" to reduce fuel sprayed out the carb due to flow reversion. 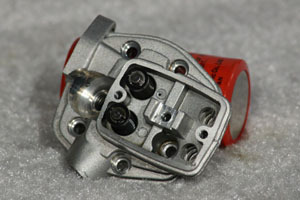 The carb needed a small adjustment and it appears to have eliminated a mid-range burble that was present previously. There is noticeably less fuel on the firewall after a day of flying. Over Memorial Day weekend 2010, the engine met it's demise. I flew right through some trees by mistake. The engine didn't get nearly as much time on it as I was hoping for. It ran OK but still tended to be very touchy on the needles with some leaning as fuel was used from the tank. I suspect a Cline fuel regulator on the fuel system would have improved things. This did give me the opportunity to strip the engine and see how things held up. The engine has a bent crankshaft, the valve cover was broken off the head, spark plug broken, and ignition lead was damaged. The combustion chamber is clean. The carbon wiped off except for the exhaust valve where is was a bit harder. Most of the run time was on E85 fuel (85% ethanol, 15% gasoline) with 8% Klotz Original Techniplate oil. The Tygon fuel lines to the carb where soft, but after taking the ruptured tank apart, I found the clunk line to be stiff. This explained the missing I was experiencing during negative manuevers. The inside of the engine was very clean. The amount of oil in the crankcase was less than expected, however. Some wear was noted on the piston. 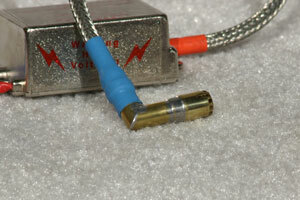 The camshaft in the FS-52 is plated with what appears to be nickel. This plating fails in normal use quite often. I have a few other engines with flaked plating. There was some plating failure visible on the cam. There was also some corrosion of components. This could be due to the ethanol in the fuel. I'd like to see more oil in the crankcase and will probably be running at least 10% oil in the future.